The John Marshall Foundation relies on support from generous individuals, foundations, and corporations committed to education, historical preservation, and the highest standards in academic scholarship. We offer special membership benefits at several recognition levels. Please join us in promoting and preserving John Marshall’s legacy by making your best gift. The Chief Justice Council, a commitment of $10,000 per year to the annual fund for the next three years. The Associate Justice Council, a commitment of $5,000 per year to the annual fund for the next three years. The 2020 Council, a commitment to make a 20 percent increase in annual giving each year for the next three years: 2018, 2019, and 2020. The Madeira Society is a group of individuals who make a contribution to the annual fund of $1200 or more each year. Quoits Club members make a contribution to the annual fund of $250 or more each year. John Marshall Society members make a contribution to the annual fund of $50 or more each year. 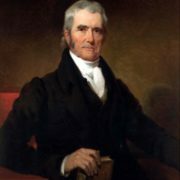 Help preserve and promote John Marshall’s legacy. Gifts of all sizes are greatly appreciated and will advance the mission of the John Marshall Foundation.